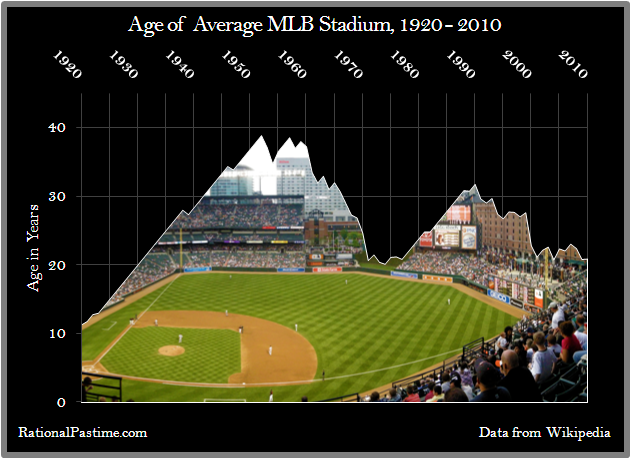 A short time ago, I authored a post at Beyond the Box Score about stadium construction trends in Major League Baseball. As promised, here's Part II of the series, focusing on pro football. In this case, I started in 1940 in order to weed out (most of) the defunct NFL teams from the sport's early years, as well as some of the early sandlot fields for which it was near-impossible to uncover construction dates. Any remaining defunct teams are absent from the database. As with the last study, I counted shared stadiums only once. The average AFL/NFL stadium reached its peak age at the start of both the 1957 and 1958 seasons, at a mean of 36.4 years. As the NFL expansion era wrapped up in the mid-1970s, the average NFL stadium reached it's youngest point at 15.4 years of age in both 1975 and 1976. In the post-expansion years, stadium ages peaked again in 1991 and 1992 at a mean of 26.7 years. The latest wave of stadium construction drove that figure quickly down to post-expansion low of 15.5 years in 2003. That last wave of construction drove the average age down at a rate of nearly 1 year per season. The largest single-season "rejuvenation" took place from 1970-71. 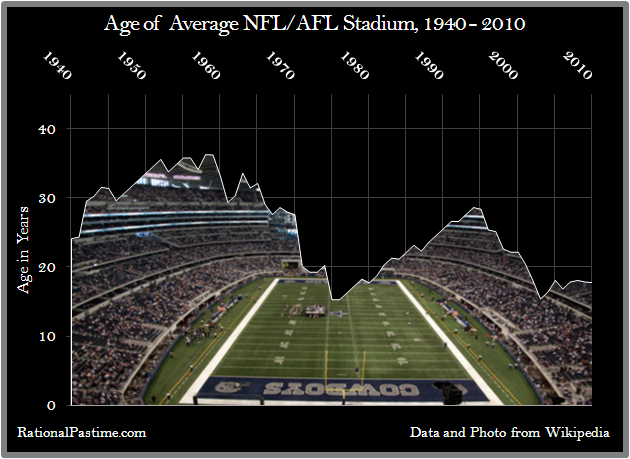 As Dallas, Philadelphia and New England all moved into brand-new stadia, and both Chicago and San Francisco moved into slightly newer facilities, the average age dropped by 7.5 years. Five seasons later, the average dropped by 5.0 years when Detroit, New Orleans and the NY Giants all relocated. The biggest single-season jump in age--a whopping 5.2 years--took place between 1941 and 1942, thanks to Philadelphia's flip-flopping between Shibe Park and a relatively new Philadelphia Municipal Stadium, and the (then) Cleveland Rams' similar vacillations between Cleveland Municipal Stadium and League Park. As noted above, the trends are very similar: two clear stadium construction booms occurring at essentially the same time. This shouldn't be too surprising, as the two sports commonly shared facilities up until the 1990s. What this suggests, however, is that stadium construction is driven as much by external (read: socioeconomic) factors as internal ones. However, a closer look will reveal two key differences. First, the NFL trend is more volatile. 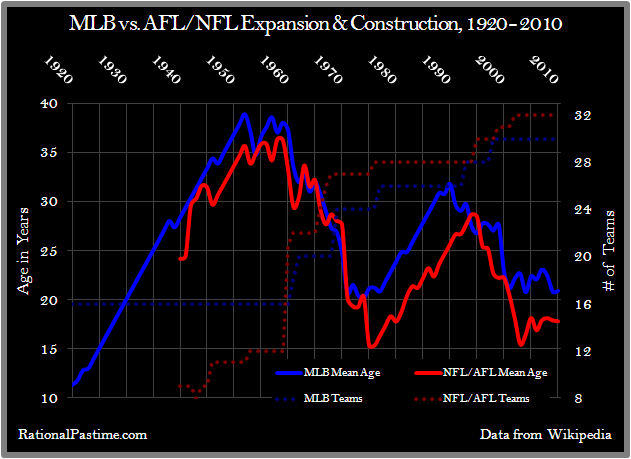 As it were, NFL teams were far more likely to change stadia in their early years than were MLB teams. In later years, NFL teams also tended to play in multiple temporary facilities while awaiting construction for a new home. The NY Giants, who played in both the Yale Bowl and Shea Stadium while awaiting construction of Giants Stadium, are an example of this. Second, the average MLB stadium has almost always been older than the average NFL stadium, sometimes by a full five years. See the chart comparing the two trends below. The age difference is far more pronounced in the post-expansion era, but has persisted nonetheless. Professional football developed later than professional baseball. Football teams were the early occupants of the multi-purpose stadium boom that characterized both sports' expansion eras. Football expanded far faster than baseball. Point #3 is key to the post-1960 data. While baseball expanded from 16 to 30 teams between 1961 and 1998, the NFL quadrupled in size from 1943 (when the Cleveland Rams took the season off due to WWII) to 2002. New teams usually mean new stadia, sooner or later. That's it for this round of analysis. If you'd like to check out the raw data for the charts above, see the tables below. Data Notes: There are three instances where a team split games between two official home fields. In 1995-96, both Seattle and St. Louis played half of a season in one facility while waiting for their new stadium to open. In 2005, New Orleans split their time between East Rutherford, Baton Rouge and San Antonio in the wake of Hurricane Katrina. In the first two instances I measured the age as the weighted average of the ages of the two stadia in which they played. In the Saints' case, I did the same but omitted their "home" game at Giants Stadium. Finally, sources disagree on where the 1945 Cleveland Rams played their home games, so I averaged the ages of Cleveland Municipal and League Park. "Finally, sources disagree on where the 1945 Cleveland Rams played their home games..."
Contemporary sources, like the NY Times and Chicago Tribune, seem to make it clear the Rams played ALL of their REGULAR SEASON games in League Park. The only game they played in Municipal Stadium was the NFL Championship game. Thanks, KJOK. Appreciate the clarification.